My strawberries are 2 years old. Both this year and last we had lots of flowers but fruits were tiny and did not ripen. Still flowering but fruits are all about the size of a fingernail. I think pollination is OK because we have loads of bees in the garden. 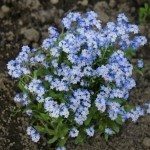 I have 2 plants and this year I transferred them into a trough which I water and feed according to the guidance I have found on this website. I will probably end up binning the plants but I would rather get to the bottom of the problem if I can. I would do more research into the variety that you have planted. Some plants need more time to mature and produce. Temperatures can play a big part in strawberry production.